There is a great need for nurses, teachers, musicians, lawyers, doctors, archaeologists, journalists, physical therapists, and people with many other qualifications and skills in all the countries where we work. We realize, as do our partners in the developing world, that many professionals don’t want to turn their life upside down and volunteer for years, so we will welcome you even if you can only join one of our programs for a month or a fortnight. Join for a fortnight, a month or a year, Projects Abroad believes in responding to each volunteer’s commitment. Our job is to match his or her skills, qualifications, experience and preferences to the real needs of real people in developing countries. 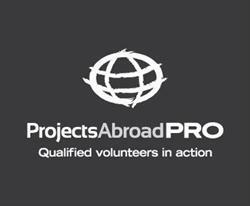 With Projects Abroad Pro, no volunteer’s time or talent will ever be wasted. Please see our new page at www.projects-abroad.org/volunteer-projects/projects-for-professionals/. I hope you decide to join us.